This centre gathered wedding veil is created in one long piece of fabric that is shaped into a curve or square veil shape at the base of the fabric to create the shape of your veil. It is gathered across the full width of the fabric and sewn onto a comb. 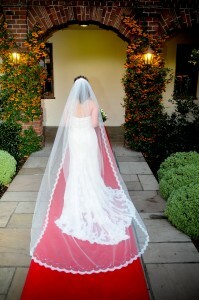 A blusher can be added as a separate piece to this veil and it can be detachable. Design Feature – on a centre gathered veil the edging is always sewn to the outer edges of the veil and will be along the side of your face as it rises up to the comb.